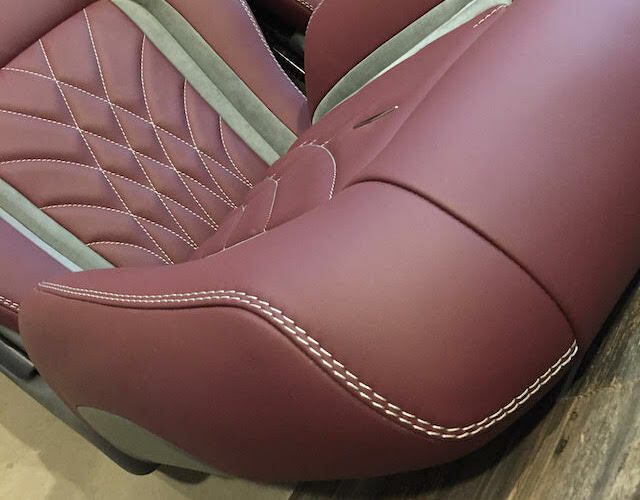 In the craft of auto upholstery, where aesthetics are paramount, it’s natural for fads to come and go. We’ve seen it with contrast piping, contrast stitching, diamond pleats and now French seams. However, it takes a forward-thinking craftsman with creativity, talent and influence to introduce a new look that catches on. 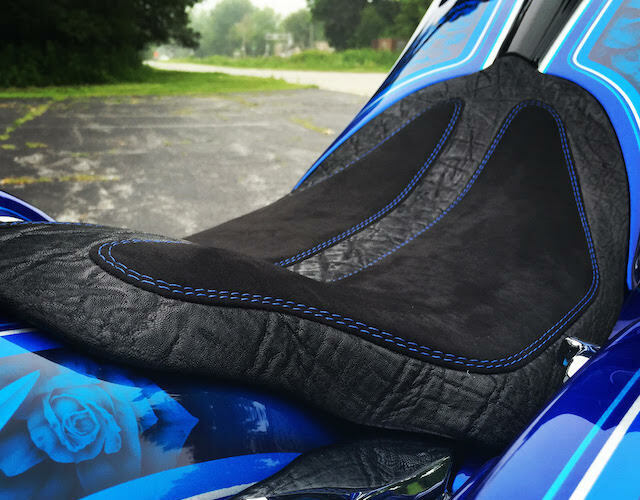 That’s exactly what Dave Vos of Customs by Vos in Griffith, Indiana, has done with the double topstitch. The double topstitch is similar in concept to the French seam, except both topstitches are sewn on the same side of the initial seam — creating a stitch design that’s as simple as it is bold and unique. 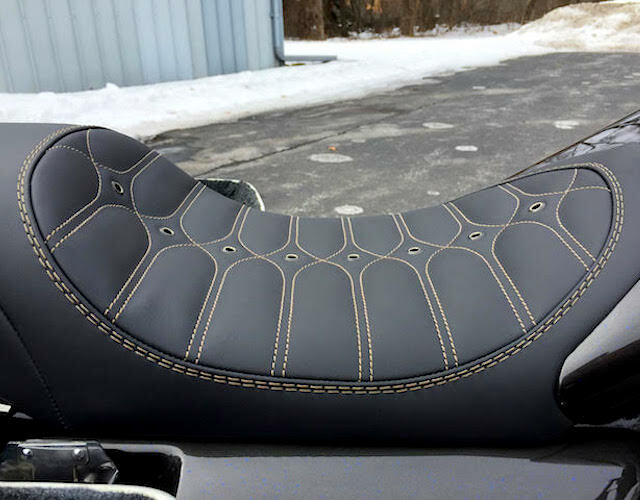 After seeing the double topstitch on the seats of a 1971 Chevrolet Chevelle that Dave is currently trimming, I knew that I had to find out more about the look. So I reached out with a few questions and he was happy to reply. How did you come up with the idea for the double topstitch? I came up with the idea of the double top stitch five years ago. 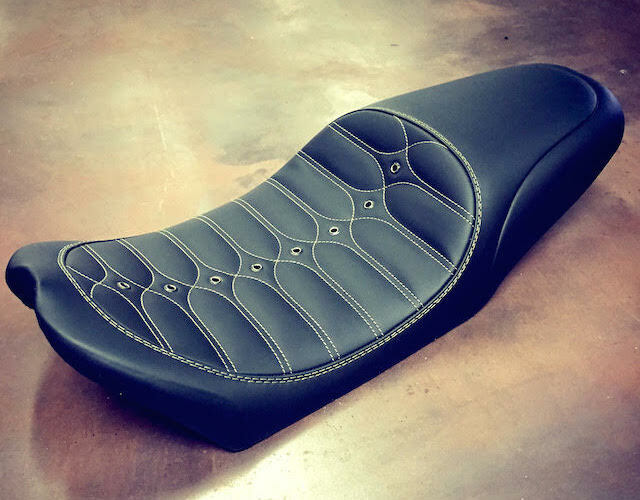 I was working on a solo motorcycle seat — black faux ostrich with an embossed black gator leather insert. The customer wanted green piping and I wanted to show off some straight stitching. Also because i was so sick of everyone wanting piping. 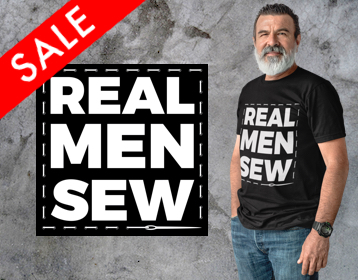 The single green topstitch wasn’t bold enough for him. So I figured I’d try laying down two top stitches to help pronounce the green stitching. It turned out great and has been a go-to seam for me since. How do you decide which side of the seam to run the topstitches? As far as laying the double topstitch out, its usually decided by whichever side of the seam is more aesthetically pleasing. What special considerations have to be taken when doing this type of stitch? When laying the seam out, you have to make sure that your seam allowance is long enough for both top stitches. We usually use 3/8″ or 1/2″. What make/model sewing machine do you use? Is it a double-needle machine? All of our stitching is done on a single-needle machine, a Juki 1541 or Consew 206rb. I did buy a used double stitch over the summer. It’s sat in the corner since. Might come in handy for something one day. 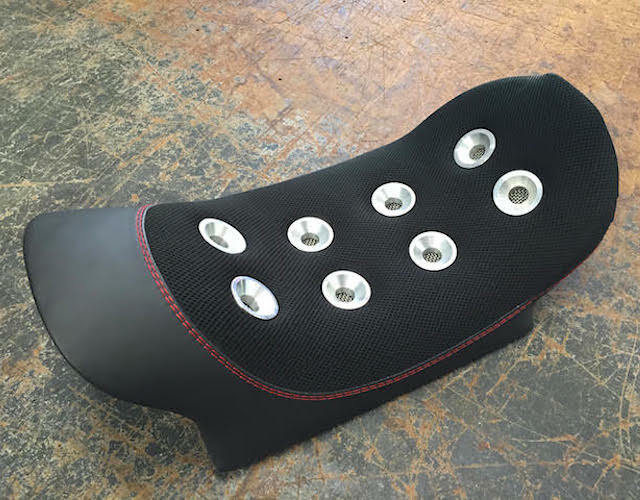 Are you using a spring-edge guide foot to get the seams so perfectly straight? No spring guide foot. Have never even tried one. Just a steady hand and foot, good eye, and lots of patience are our key to keeping the double topstitches nice and straight with one another. What size needle and thread are you using? We usually try to run a 210-size thread with a size 23 needle for a nice contrast with top stitching. Do you prefer the double topstitch to the French seam? Hmm… I really don’t have a preference. It depends on the application. A perfectly straight, tight French seam has elegance to it unmatched by any other. 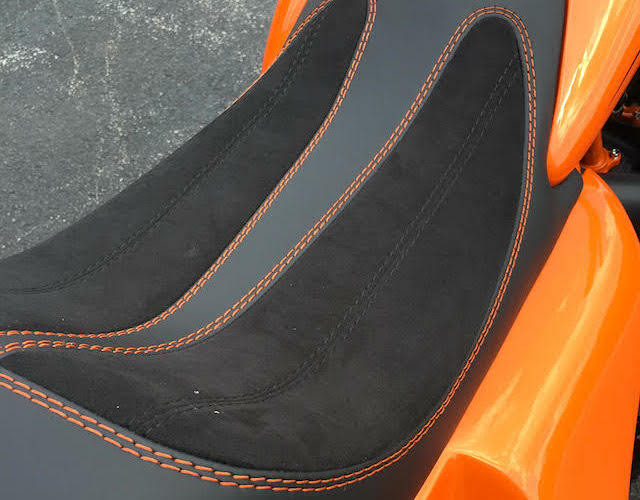 The double top stitch has more of a sporty feel to it I suppose. And colored piping is hopefully gone forever…LOL! Okay, I guess it’s not that bad in the right situation. I’m currently using the double topstitch as a French seam replacement for the first time in two cars, a ’71 Chevelle and ’67 Mustang. 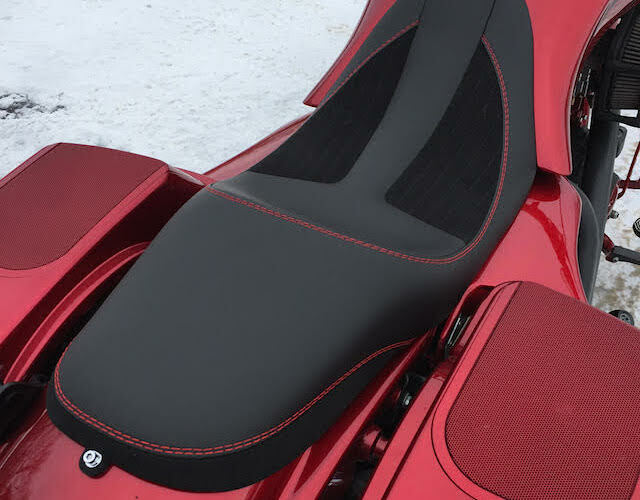 The combination of the double top and French seam on the same seat is also appealing. When we published a shop profile of Customs by Vos in June 2014, Dave had just moved into a new shop and hired talented trimmer Dane Utech, a decision that has worked out very well for the shop. 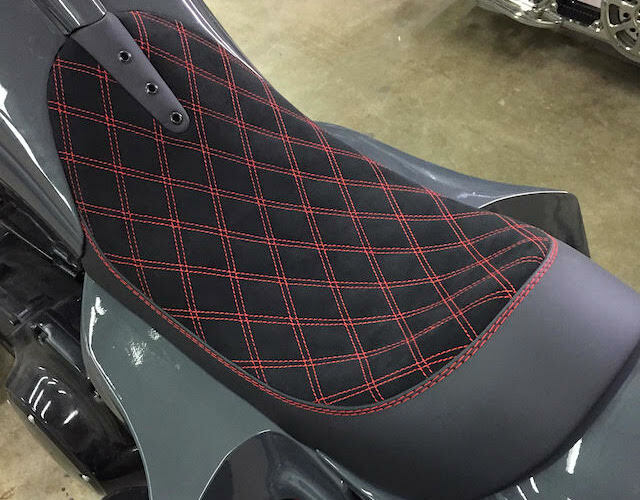 Dave and Dane are on the cutting edge of automotive upholstery. Their creative ideas and sleek designs, including the double topstitch, are setting new trends throughout the industry. So what does the future hold for Dave and Customs by Vos? For one, they’re looking to hire new employees. Interested in the gig? Check out Customs by Vos on CustomsByVos.com, as well as Facebook and Instagram. There you can find their contact information and inquire about a job.